"A Haunting" is a paranormal series that now comes on the "Destination Channel." The Destination Channel is a sister channel of the more popular "The Discovery Channel." This series was on hiatus from November 2007 to the early part of 2012. It reenacts the stories of people who say they have encountered supernatural spirits and possessions. It has always been one of my favorite shows on television. I was amazed it was taken off of TDC back in 2007. Now, I'm not going to say I believe everything they bring out on ghosts, evil spirits, possessions of people and the like. But, it is very entertaining. 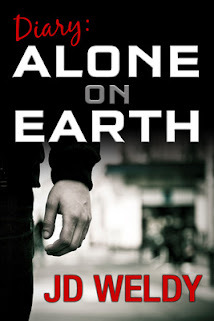 To me, the narrator makes this series. His voice is spooky and he doesn't interfere with the story itself as many narrators are prone to do. The last episode I watched had to do with the Legend of Starvation Peak. The name of the episode is called "Death's Door." This blog entry is not about the series or that episode. It is about Starvation Peak. The Legend of Starvation Peak centers around Spanish settlers, who were pursued by hostile Native Americans, who took refuge and starved atop El Cerrito de Bernal, a small butte rising 7,031 feet, about 12 miles southwest of Las Vegas. 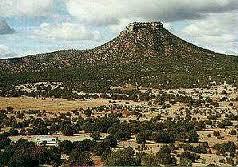 As a result, since anyone can remember, the small mesa has been called Starvation Peak. Now, no one has ever been able to find any evidence for this so-called legend of mass slaughter. The first report of this legend came in 1884 in the Detroit Free Press. This allegedly occurred in Spanish colonial times. Settlers were pursued by Navajo Indians, and took refuge at the summit of the small peak. According to the newspaper story, after a long stalemate, the starving settlers descended the peak and all 36 were massacred. Those remaining at the summit starved to death rather than be tortured to death by the Native Americans. Again, no evidence of this story has ever been found to collaborate this ever happening. I found the story interesting simply because I had never heard of it. It reminds me of what the movie "Brave Heart" came out. I had never heard of William Wallace until that time. If you get the chance, you will find the episode of A Haunting fascinating since it deals with Starvation Peak quite a bit. Starvation Peak has no other significance I could find. But, the legend itself makes Starvation Peak a fascinating story. MR. Kikkoman. My father is from Las Vagas N.M.. He told me storys of starvation peak. Do you know any family names of the Castallano's. He also said we are related to Salazar family from Bernal and Vagas. Can you help Please. My father moved to Denver, Colo. His name was Raymond Castallano.